Natural light and verdant views enter the penthouse through considered apertures. Artwork: Brent Harris. 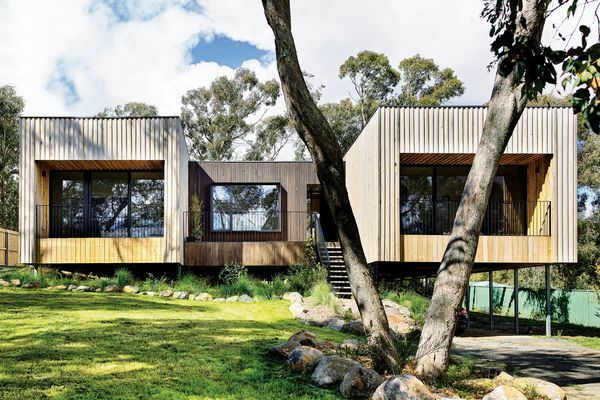 In recent years, the quantity of multiresidential developments has been increasing in Australian cities and the design quality of these buildings has attracted scrutiny from many communities and governments. Unfortunately, there has been a shift from apartment as “home” to “commodity” and many cheaply built, unremarkable buildings have been erected quickly to achieve the highest possible monetary returns. Whitlam Place, a new residential development in Melbourne’s Fitzroy by Freadman White and Anon Studio, is a clear response against this financially driven model. 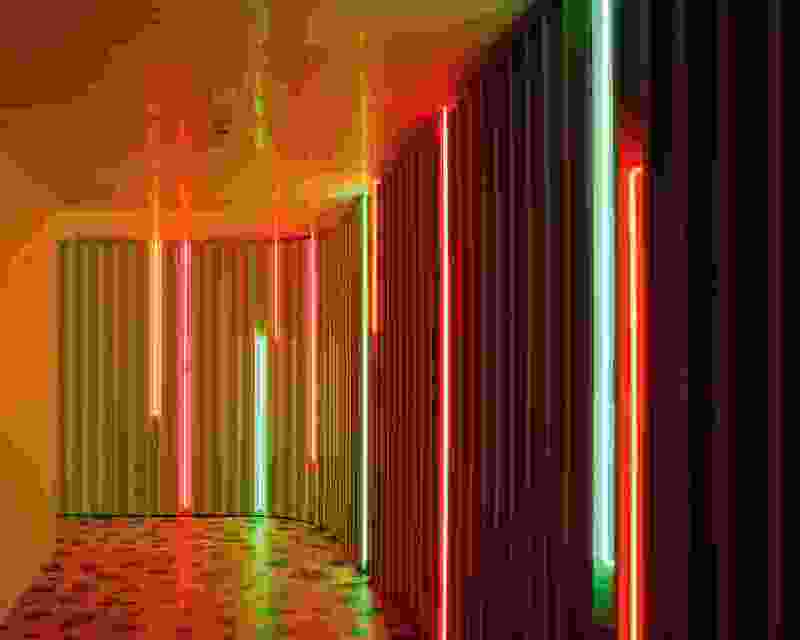 The intensely tailored design approach has led to a collection of eleven elegant, bespoke homes and the strategy is apparent as soon as you step foot inside the neon-lined circulation spaces, which are akin to a Dan Flavin light installation. The unwavering commitment by owner-developer and collaborating designer Marcello Donati of Anon Studio, who lives in the penthouse apartment, ensured that these highly sought after apartments were designed to endure the test of time. The building’s trapezoidal pop-out windows accentuate angled skyline views from its interior. 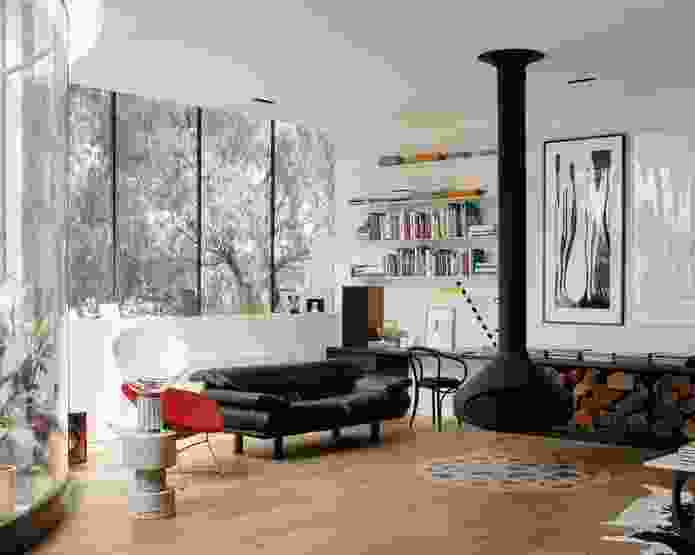 Whitlam Place is a stone’s throw away from Fitzroy’s Brunswick Street. It sits adjacent to a small pocket park and across the road from the iconic Fitzroy Town Hall. Ilana Freadman and Michael White, co-directors of Freadman White, have taken cues from the proportions and height of the classical stone town hall, ensuring that the parapet of the new four-storey building isn’t taller than the town hall’s tower. The distinctive green and bronze tones of the copper oxide finish applied to the concrete exterior of the building form a dynamic backdrop to the neighbouring park, with many of the dwellings enjoying views into the silvery treetops. 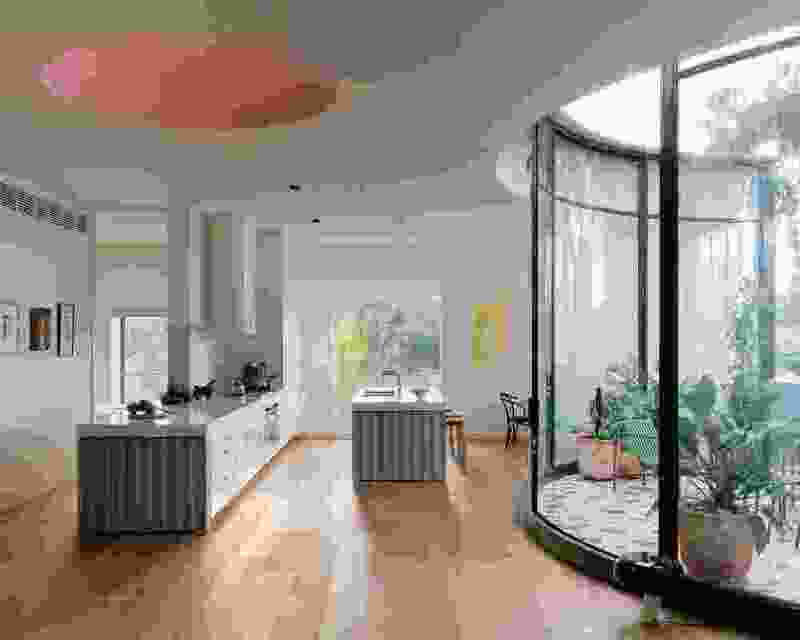 Marcello’s apartment is, as Michael describes, “the glass jewel on top of the brutalist base,” with curved glazing wrapping around a private rooftop courtyard that faces south to the park. When the sliding doors are open, this outdoor space expands the already generously sized living area. 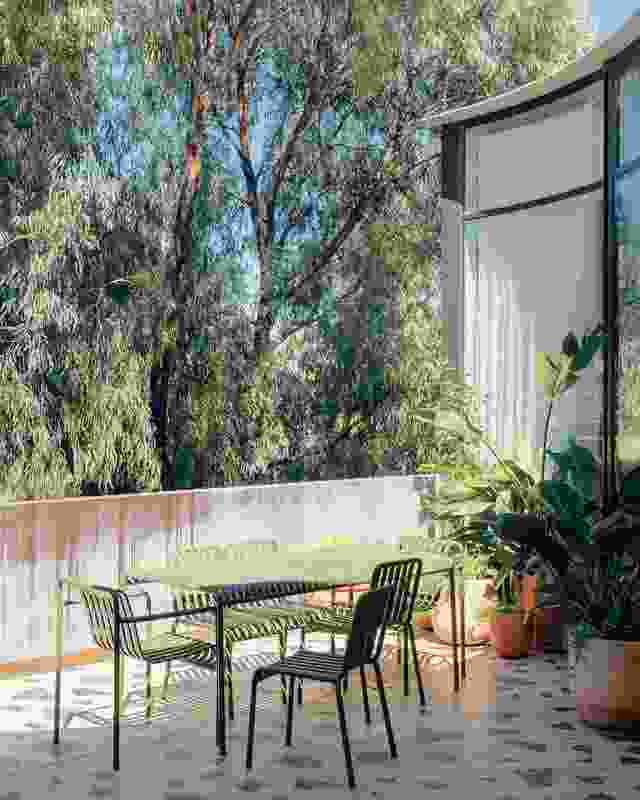 Within this open-planned space, zones are defined by the semicircular shape of the courtyard that cuts into the otherwise rectangular plan, where “each piece of furniture is nicely held.” This planning is reminiscent of a traditional courtyard house, with a centralized focus point. 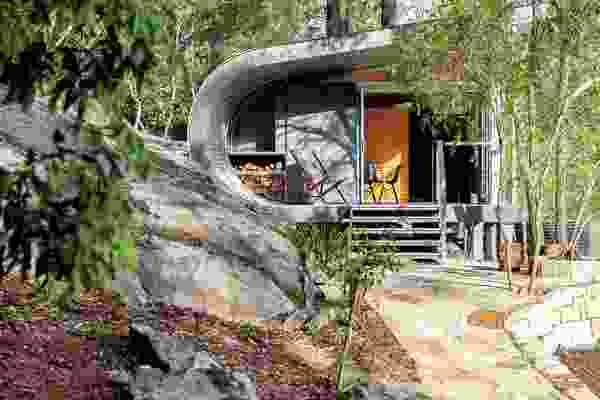 Priority is given to these main public areas of the home and the private sleeping and bathing spaces are intentionally modest in size. 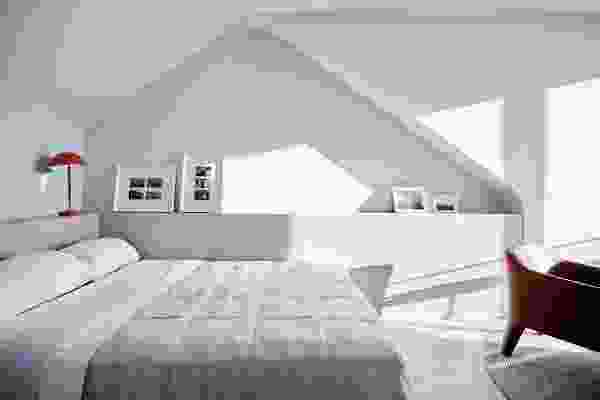 A three-level light shaft within the building provides natural light and ventilation to the second bedroom and both bathrooms. Although the apartment is standard in terms of proportion, the finishes and artisanal approach are carried through from the living areas to the more intimate spaces, rendering it far from standard. The apartment is detailed with pink and green, Australiana-inspired terrazzo. Artwork: Brent Harris. The two-bedroom penthouse has a striking spatial energy, with the coloured oculus skylight giving the impression of a James Turrell artwork as the light changes its shade from aubergine to apricot throughout the day. Italian design influence and sensibilities are felt in the pink and green terrazzo flooring, playful Scarpa-esque detailing and the character of Marcello’s eclectic furniture. “Collectively, we really love the curiosities of things. There are moments around the building that you might say, ‘Why would you do that?’ But we really enjoy those moments,” says Michael. An example of this is the way the marble kitchen splashback wraps around the wall toward the bedroom. 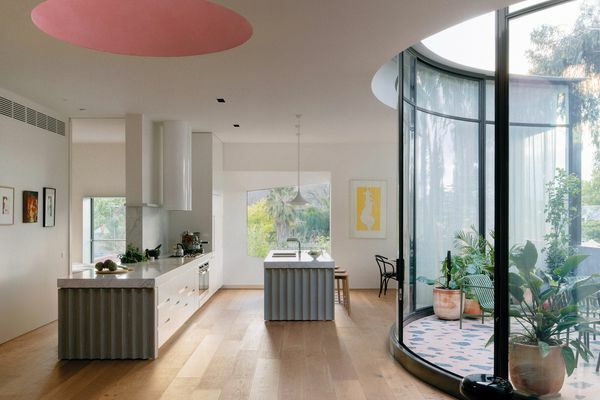 Trades have been used for more than one application – for example, the tiler who developed the Australiana-inspired pink and green terrazzo patterns with Freadman White and Anon Studio also made the tiled table surfaces. The building’s architecture strongly defines the interior design, which was important to all collaborators on the project. A feature of both the exterior and interior architecture is the pop-out windows that choreograph a particular experience of the city skyline view. Externally these bronze-framed windows give depth and texture to the facade and internally the circulation is curated toward the deep portal to accentuate the angled perspective. Each of the eleven apartments has a different personality, suiting the needs of a variety of occupants. Marcello’s sister, her partner and young baby live next door in a slightly more restrained and rectilinear two-bedroom apartment. Given the majority of the owner-occupiers are downsizers looking for a lifestyle of convenience, floor plans have been customized to suit favourite furniture pieces, including a baby grand piano. 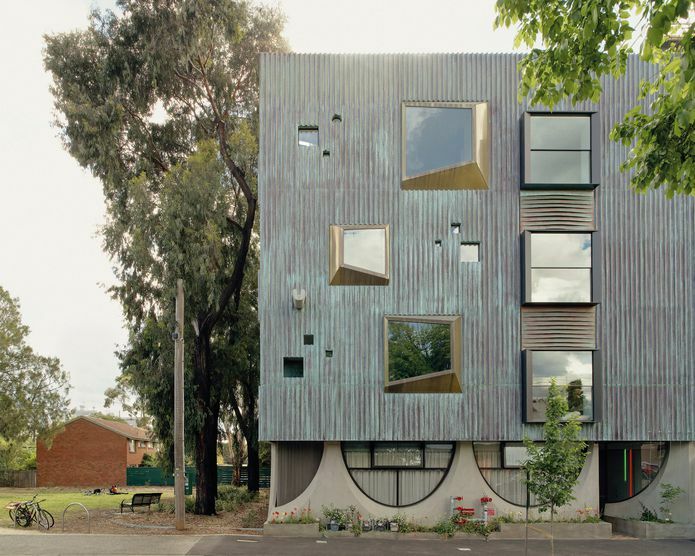 Although Freadman White experimented with mixed-use development for its first multiresidential project, North Melbourne Townhouses (see Houses 96), Whitlam Place is an entirely residential development. There was potential to activate the adjacent public open space, but the height and spatial requirements for ground-floor commercial tenancies ruled out this option. However, one of the owners runs a counselling service from her ground-floor apartment, which has been modified to suit the needs of her business. Some owners have also considered using their apartments for short-term Airbnb rentals. For Ilana and Michael, adaptability and flexibility are important aspects of design and this is clearly evident at Whitlam Place. 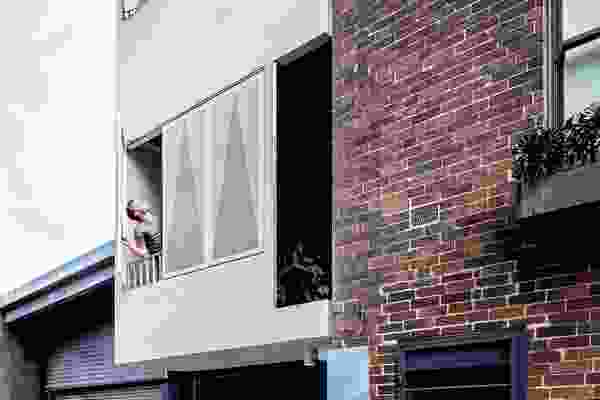 Despite the lack of communal space within the building, Marcello attests that there is a strong sense of community at Whitlam Place – recent neighbourly gatherings are a testament to this. There is pride in, and ownership over, the finely crafted building, which naturally brings people together. With a huge responsibility to its context, this well-proportioned building responds and gives back to its neighbourhood. 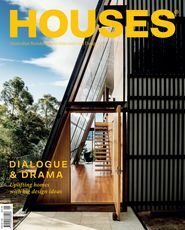 Whitlam Place is an evolution of the North Melbourne Townhouses and incorporates lessons derived from a suite of flexible and customized single, detached dwellings. Not every development has the opportunity to be as nuanced as Whitlam Place, but this medium-density building is an exemplar in how to design apartments as homes. Lysaght Klip-lok roofing in Colorbond ‘ Shale Grey’. Euro Precast precast concrete in Porter’s Paints Liquid Copper and Patina Green. Windows on the World steel windows and AAA Advanced Trusses and Windows aluminium windows in Dulux ‘ Metropolis Bronze Pearl Satin’; Specialised Cladding and Roofing brass trapezoid windows. Engineered timber floors from Kate Walker Design; Forest green marble terrazzo; Carrara marble Palladiana terrazzo floor. Memphis Oceanic table lamp by Michele De Lucchi; Flos Glo-Ball lights by Jasper Morrison from Euroluce; Flos Snoopy and Taccia lamps by Achille and Pier Giacomo Castiglioni; Archier Highline pendant; Gubi Semi pendant from Luke Furniture; custom neon lighting. Carrara marble benchtop; glass-reinforced concrete bench end panels; Marmorino polished plaster; Qasair rangehood; Miele appliances; custom joinery. Rogerseller tapware in chrome; Vola heated towel rail in chrome; custom Elba marble vanity and robe hooks. Oblica wood fireplace; hydronic heating; reverse cycle air conditioning. Custom green marble and ‘ Persimmon’ terrazzo terrace floor. Knoll Bertoia Large Diamond chair; B&B Italia Alanda sofa by Paolo Piva. 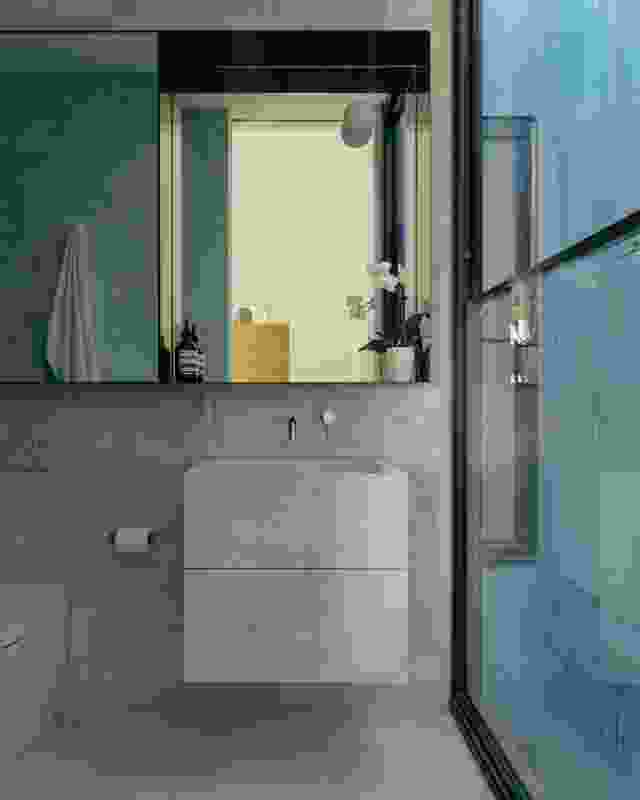 A central light shaft, washed with a green copper oxide finish, illuminates the bathrooms. A south-facing balcony borrows its leafy outlook from the neighbouring pocket park. Neon lights line the foyer and hallways, bringing a lively personality to shared spaces.